The marine industry has made great strides in embracing and advancing the environmental spirit of the continuously evolving regulatory landscape. However, in a world where everything is “green,” these changes have caused a certain degree of confusion in terms of potential environmental impact, requirements and exemptions. By better understanding these regulations, operators can use a variety of environmentally acceptable solutions, including Environmentally Acceptable Lubricants (EALs), to significantly reduce fines and cleanup costs associated with discharges and to mitigate possible environmental and reputation damage. The Clean Water Act (CWA) of 1972 is the principal federal statute protecting navigable waters and adjoining shorelines from pollution. The CWA forms the foundation for regulations detailing specific requirements for pollution prevention and response measures. Section 311 of the CWA addresses pollution from oil and hazardous substance releases, providing the United States Environmental Protection Agency (EPA) and the U.S. Coast Guard with the authority to establish a program for preventing, preparing for and responding to oil spills that occur in navigable waters of the United States. The EPA implements provisions of the Clean Water Act through a variety of rules and statutes, including the National Contingency Plan and the Oil Pollution Prevention regulations. The regulation is applicable to all commercial vessels larger than 79 feet, operating within three nautical miles of either the United States coastline or any one of the Great Lakes. The 2014 Small Vessel General Permit (sVGP) for non-recreational or non-military vessels less than 79 feet in length that are operating as a means of transportation will require compliance beginning Dec. 19, 2017. Regulatory pressures from the EPA, U.S. Coast Guard and other environmental organizations continue to mount. All petroleum hydraulic fluid spills are “reportable events,” and, while small petroleum releases will not result in a full Resource Conservation and Recovery Act (RCRA) cleanup, large spills will. These events involve a great deal of cleanup cost, administrative procedures and punitive fines that can range from tens of thousands to hundreds of thousands of dollars. A 2010 study estimated operational discharges (including stern tube leakage) input 36.9 to 61 million liters (9.7 – 16 million gallons) of lubricating oil into marine port waters annually. Leaks of lubricating oil represent 10 percent of the total oil inputs into marine waters, as estimated in the 2003 NRC Oil in the Sea study. The total annual estimated response and damage costs for the U.S. portion of these discharges are estimated to be $31 million annually (Etkin, 2010). There is a common misperception that the Coast Guard approves oils based on the oil not leaving a sheen. Under the legal authority of the CWA, the Discharge of Oil regulation, more commonly known as the “sheen rule,” provides the framework for determining whether an oil spill or discharge to inland and coastal waters and/or their adjoining shorelines should be reported to the National Response Center. Specifically, the regulation requires the person in charge of a facility or vessel responsible for discharging oil that may be “harmful to the public health or welfare” to report the spill to the federal government. The regulation also establishes the criteria for determining whether an oil spill needs to be reported. • Discharges that cause a sludge or emulsion to be deposited beneath the surface of the water or on adjoining shorelines. In actuality, the Coast Guard does not approve, recommend or specify fluids, nor does it approve or recommend any testing procedures. That said, while discharges of biodegradable hydraulic fluid must be reported, agencies are required to evaluate environmentally acceptable solutions differently than petroleum based oils. According to the EPA regulations, the use of any EAL - regardless of the application - does not authorize the discharge of any lubricant in a quantity that may be harmful, as these oils may still cause undesirable, though less severe impact than petroleum based counterparts. Based on this potentially reduced negative impact, under certain circumstances and on a case-by-case basis, EPA and/or U.S. Coast Guard authorities may consider whether a vessel used an EAL in their enforcement response. As awareness of biodegradable fluid has increased, state and federal agencies become more lenient toward those using readily biodegradable lubricants, often resulting in significantly reduced fines and cleanup costs. In fact, there are several case studies of equipment releasing several hundred gallons of vegetable based hydraulic fluid into environmentally sensitive areas with no fines and minimal cleanup expense. In most instances, the operator was able to continue working while cleanup efforts were underway. And, since the fluids were readily biodegradable and minimally toxic, there was no long-term negative effect to the ecosystem. Thanks to the latitude available to the National Reporting Center, EPA and U.S. Coast Guard, many companies have experienced significantly reduced fines or received no fine at all and minimal to no remediation mandates following a spill when they demonstrated use of an EAL. Marine operators have reported remediation costs for incidental petroleum based spills/discharges to range anywhere from $2,000 to $10,000 and sometimes beyond. In marine operations, oil and lubricant spills and discharges are a given. The industry has worked diligently to meet and exceed what is required of operators in these situations and to proactively minimize their adverse impact on the environment. Broad use of EALs is one way to help address the issue, but it’s important to choose wisely. Products can make false or misleading claims and no discharge is exempt from reporting, regardless of the lubricant or oil in question. Operators no longer need to choose between performance and sustainability. 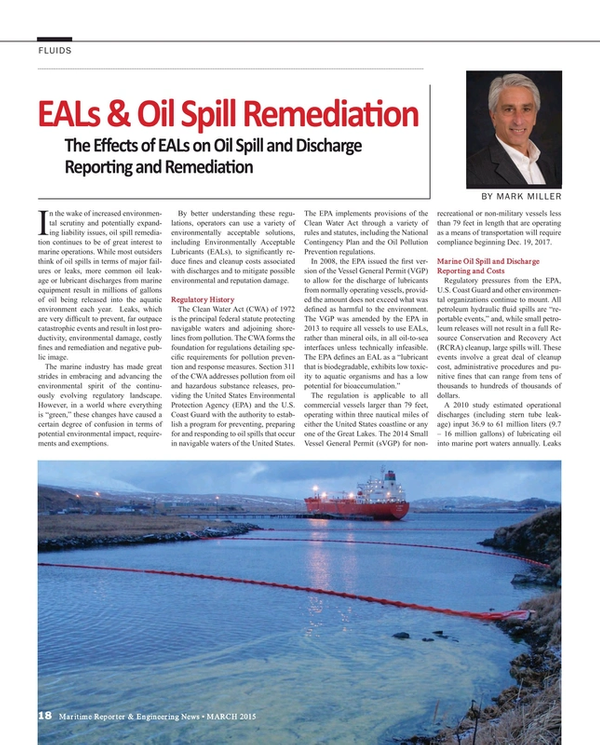 By embracing EALs and understanding regulations, it is possible to improve water quality and safety while achieving significant costs savings even in the face of spills – a major win-win. Mark Miller serves as executive vice president at RSC Bio Solutions, a leader in the area of biobased cleaners, degreasers and readily biodegradable functional fluids. The company provides high-performing, readily biodegradable (ASTM 5864 and ASTM D7373 compliant), safer biobased chemistries and specialty products that extend the life of equipment and tools while reducing clean-up costs and mitigating negative environmental impact. The company’s products have been tested and proven in some of the toughest environments possible.